When everyone tries to tread the same and safe path of love, foreign locales and stars for their films, Sujoy Gosh, notwithstanding his earlier not very successful efforts has ventured on a thriller set in the milling crowd of Kolkata city. ‘Kahaani’ is an unusual film, which has come alive on the screen in recent years. Vidya Balan is the only star attraction of the movie and all the others are just unknown faces to a normal Hindi movie goer. Yet, the film makes a lasting impact on the viewer with the quick succession of scenes and characters full of life but with least investment on expensive sets and show. A woman in advanced stages of pregnancy coming to Kolkata from London in search of her missing husband and the first scene itself makes one sit up and watch as the taxi driver says ‘Madam, normally from airport passengers will go to hotels or homes and you are the only one who is going to the police station’. The story with incredible incidents race through the streets of Kolkata, dingy offices and some opulent IT centers and the climax culminates into the mega mela of the last day of Durga Puja. 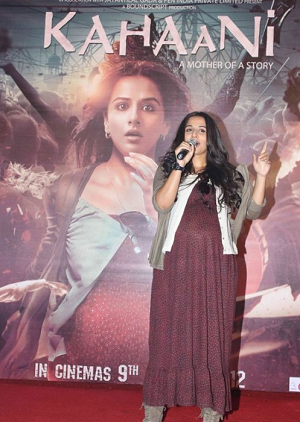 Vidya Balan once again proves that she is a versatile and director’s actress. She needs special appreciation for donning the role of the pregnant woman with least glamour. The other characters interestingly move the story forward with several unexpected twists and turns. The music is apt and unobtrusive. I really enjoyed watching ‘Kahaani’; a movie worth watching and pondering.